A little selfie chronicle on this beautiful Cinco de Mayo Monday! Yes, I am in a fitting room (bonus points if you can figure out where) but that is besides the point... any full-length mirror is a great excuse to document daily wear, is it not? How else am I supposed to project an image of authenticity? Right? RIGHT? This is the perfect display of me, existing on a daily basis. Now onto the subject at hand: do you sometimes put together an outfit that just feels like it needs that little something extra in order to feel complete? Exibit A: this casual daytime stripe-heavy ensemble felt great on its own -- it was comfortable and a good breton always feels right. But despite the sentiments of inner-approval, my instincts kept whispering at me that something was missing, leading me to reach for my favorite lid. The cherry on top of the sundae! 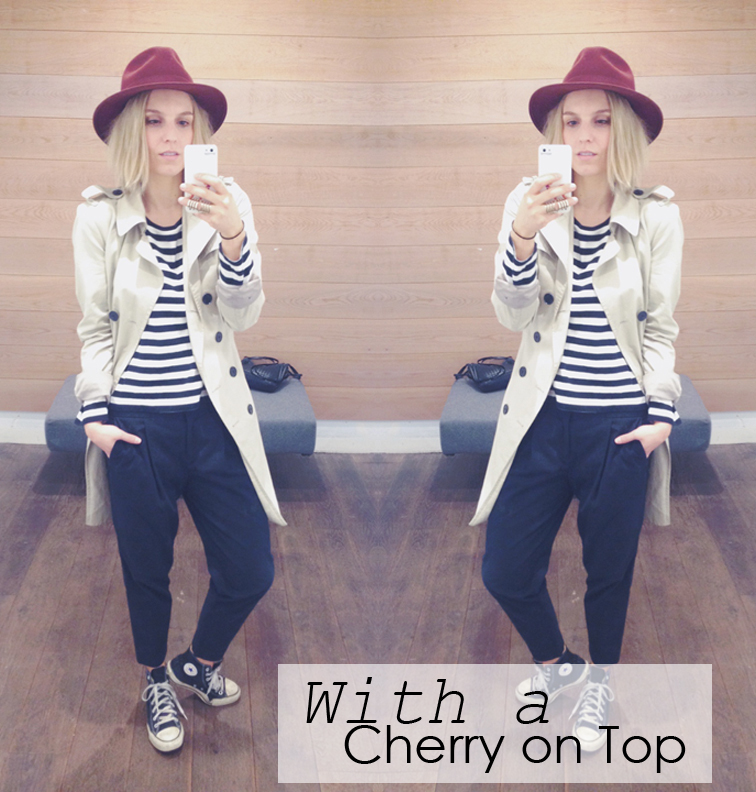 this outfit is so nice, love the trench coat and the top, great stripes! The hat looks amazing! I also love love love the high tops on you! You look amazing, as always ;)! Cherry on top of a delicious cake more like! The hat really does complete the outfit. I've been deliberating buying a similar hat in lilac or something but since most fedoras are like wool, not sure if my new 'summer hat' would be a bit of an oxymoron?! 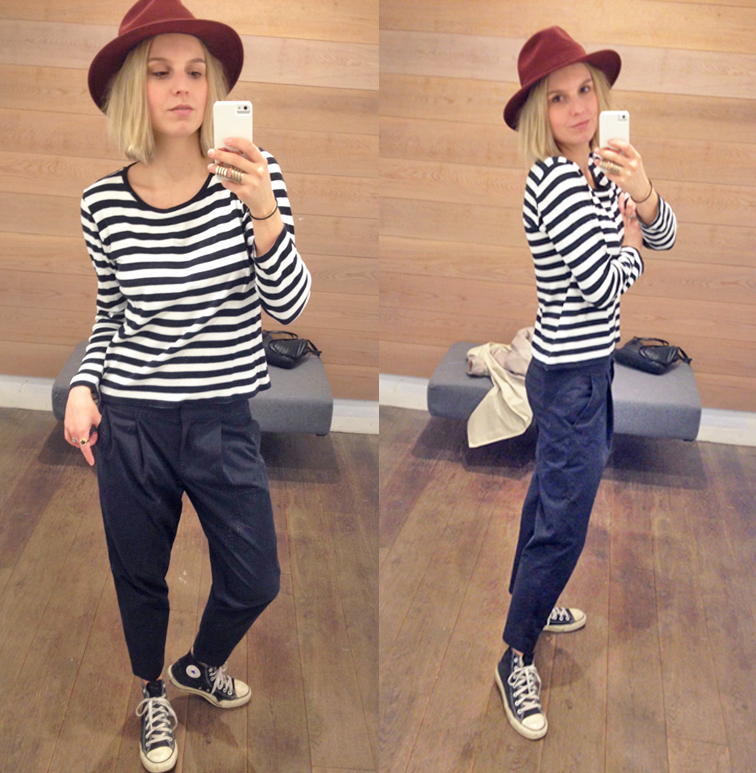 Love this laid-back outfit Helene! Love your casual style and the red topper! So cute. 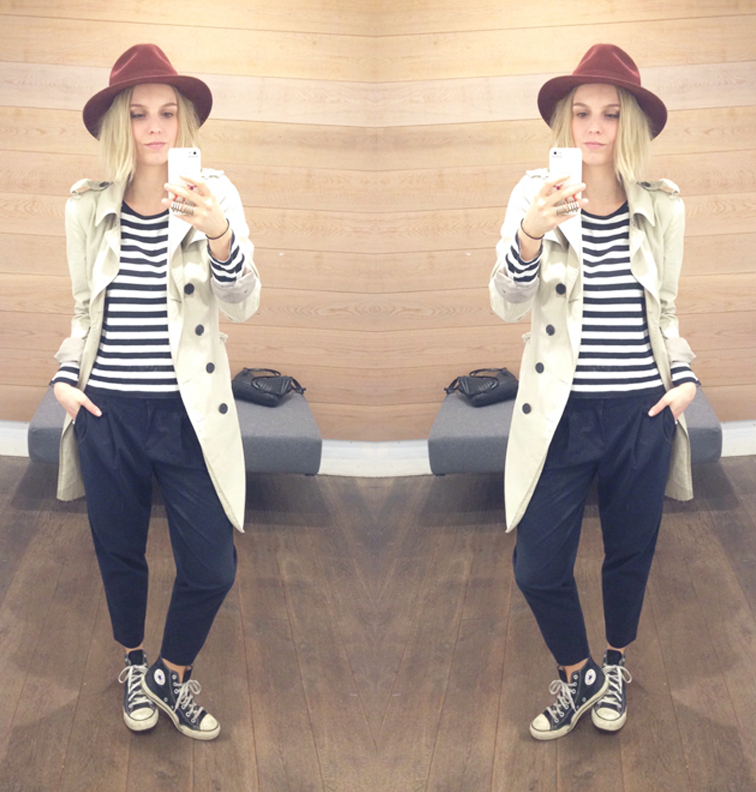 You look effortlessly chic in this amazingly styled classic outfit, love it from hat to sneakers! Thanks for your opinion on my last post, hope you're having a great week so far. You look great in this hat. that's a cool outfit. love the striped top and pants. great hat!